This crow is one of four crows who were rescued when their nest fell from a tree. 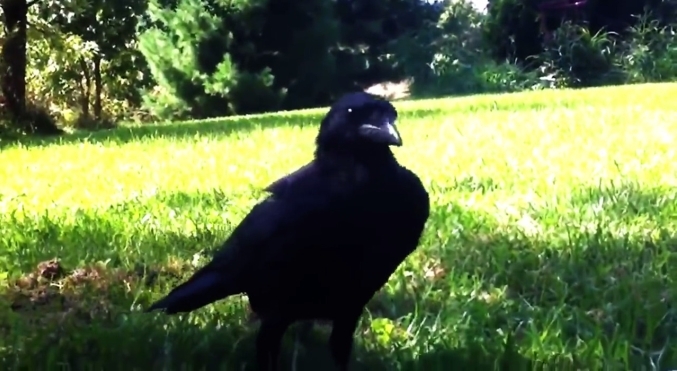 A veterinarian and her family raised the crows and they were released into the wild. They were accepted by a family of wild crows and still come back to visit, four years later. At least two will visit the backyard feeder and occasionally say hello. This year, they have also started saying mom very clearly. They were not intentionally taught to say hello or mom. These birds are incredibly intelligent! In other words, much like humans, the crows recognize faces, and link them to emotions and memory, across diverse areas of the brain. They can recognise faces, use tools – even drop nuts on a road for cars to crack (then pick them up with the safety of pedestrian lights). Birds in the corvid family – most famously, crows – are known for their intelligence. Even ancient Greek storyteller Aesop wove their problem-solving nouse into his famed fables. Responses to "Rescued Crow Comes Back To Say "Hello" To The Vet Who Saved Him"
Such darling bird, so clever, repeats the "hallow" so many times, as many as the human calls. Amazing, adorable, magic, the communication between animals and humans.